Director/Story – Bibo Bergeron, Screenplay – Bibo Bergeron & Stephane Kazandjian, Producer – Luc Besson, Music – -M- & Patrice Renson, Animation Director – Fabrice Joubert, Production Design – Francois Moret. Production Company – Europacorp/Bibo Films/France 3 Cinema/Walking the Dog/Canal +/France Televisions/CineCinema. Paris, 1910. The movie projectionist Emile also works for the deliveryman Raoul. They make a delivery to the home of a scientist while he is away and are let in by his trained monkey Charles. Fooling around in the laboratory, Raoul accidentally drops a seed in a pool of water, causing a giant sunflower plant to grow, which in turn causes chemicals to come together and create an explosion. In the aftermath, Emile sees a large insect-like creature that promptly flees. Over the next days, there are reports of a monster haunting the city. The police chief Maynott determines to hunt it down. Both Maynott and Raoul have eyes for the nightclub singer Lucille. In the alley outside the theatre, Lucille comes across the insect creature and is taken by its genteel manner and beautiful singing voice. She names it Francoeur and grants it shelter. There she discovers it has an aptitude for music. Disguising Francoeur, she and it form a stage act to rapturous applause. However, Maynott comes, determined to kill the creature. When Raoul and Emile discover that Lucille is sheltering the monster, they become drawn into protecting it from Maynott. This is a French animated film that emerged with a reasonable degree of acclaim. It is solo directorial outing for Bibo Bergeron, a French animator who has worked in numerous capacities on various Disney tv shows and DreamWorks films, before graduating to co-director of DreamWorks’ The Road to El Dorado (2000) and Shark Tale (2004). It is produced by Luc Besson, director of cult action films like Nikita/La Femma Nikita (1990), Leon/The Professional (1994) and The Fifth Element (1997), whose name seems ubiquitous on almost any genre or action film emerging from France these days. A Monster in Paris is a beautifully animated film. Bibo Bergeron opts for an unusually stylised form. The characters are non-naturalistic and elongated as though in squash-and-stretch animation. At the same time, the buildings and period surroundings of Paris are drawn with a high degree of naturalistic detail, there being some especially lovely backgrounds of the streets and during the climactic action in and around the struts of the Eiffel Tower. 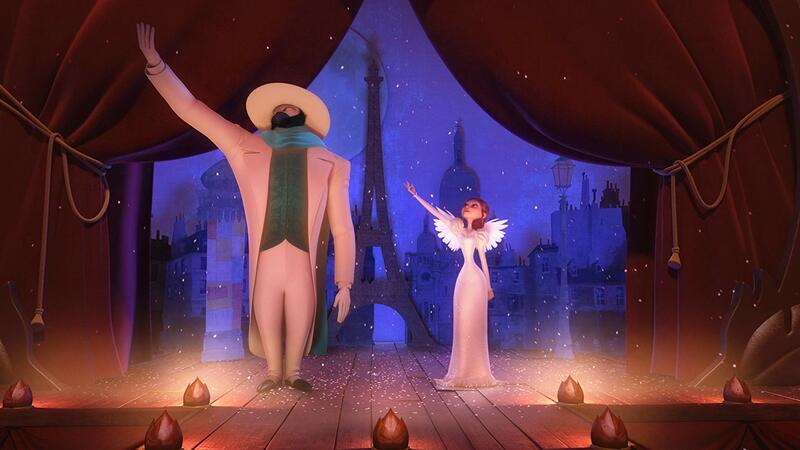 The film holds some gorgeous animation during the scene where Lucille and Francoeur do their song and dance number for the first time. Bergeron throws together a highly entertaining chase sequence that climaxes the film involving various characters pursuing one another in a runaway cable car gondola, riding a billboard down steps, racing through the streets in a street car, Catherine the Truck, a hot-air balloon and with Catherine afloat in the Seine using the automatic backdoor as a paddle, before everyone ends up in a fight around the Eiffel Tower. There is a great energy and creativity to these scenes. The is focused around the comic bumblings of its point-of-view duo, the scientist’s monkey, the unusual pairing of the monster and the girl – and with nothing in much more in depth or that searches inside the characters/emotions than that. The characters are likeable animation standards but one never feels that there is anything about them that emerges as fully rounded or that endears them to the audience. The story also seems on the slight side when it comes to explaining what exactly created Francoeur and the giant plant. The monster and his relationship with the girl diva seems undeniably based on The Phantom of the Opera – especially when Francoeur places on a white mask during the performance that makes him look exactly like the Phantom of Andre Lloyd Webber musical fame.